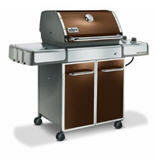 ﻿ Weber Gas Grills Web Site-Weber Gas Grill Won't Heat? Since 1995 all regulators (the part that attaches to the gas tank to regulate the flow of gas) have included a safety device that restricts the flow of gas in the event of a gas leak. 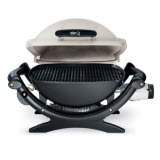 This safety device can be inadvertently activated in two ways, putting the grill into what is commonly called “bypass”. The first way for the device to be activated is to leave one or more burner control knobs in the “ON” position when the LP cylinder valve is opened. The second is not to wait long enough to “start” the grill after opening the LP cylinder valve. The safety device in the regulator is activated each time that the LP cylinder valve is opened. The device resets itself when the gas pressure equalizes between the closed burner control valve and the regulator, through the hose. If a burner control knob is turned on before the gas pressure can equalize, the device will remain in “bypass”. 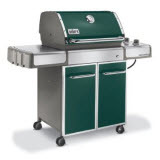 The length of time necessary to wait to “start” the grill after turning on the LP cylinder valve is dependent on the length of the hose and outside air temperature. It is always good practice to wait a few seconds after opening the LP cylinder valve before turning on the burner control knob to start the grill. Keep in mind that the safety device reacts to a gas leak. 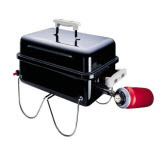 If a grill is in bypass the gas connections and hose should be tested for leaks with a soap and water solution. * Press the igniter until the burner is lit. Weber Q 100 and 200 series with an adapter hose and the Q 300 series. * The grill should preheat to 500-550 degrees in 10-15 minutes.